October Paper Pumpkin KIT = FABULOUS!!!! Here is a great unboxing video of exactly what is in the October Paper Pumpkin Kit. If you been following me for a while, you'll know of all things: I'm honest. I tell you like I see it. If I think something is sub-par, I will let you know. If I think something is SUPER-duper, FANTABULOUS and stinkin' amazing and cute....AND YOU NEED TO RUN, not walk or dilly-dally, you will know that, too!! This kit, with all the hype SU! has had around it, TRUELY lives up to the expectations. It's ADORABLE, EASY and you are going to LOVE it!!! I'm going to be working on a variation of this kit if for some chance you don't need the cards and you'd prefer something different, like holiday table decor or home decor! Stay tuned to see what fun happens today. These little ornaments came together pretty quick and I'm so GLAD to use up my supply of cork circles I purchased originally, for a wedding project. It's one of those things that has been stuck in the back of my crafting cabinet for a couple of years, and I always open the cabinet...and there they are staring at me. "What are you going to do with me? ", they ask, like sassy little smartie-pants. I do what any good crafter does and ignore them, or look directly at them and threaten to give them a nice long toss into the trash! I applied for a craft show this week. Over in Franklin, IN on November 11. I'll share more details out after I've heard back from the organizers. It's juried, which means they screen all the applicants. I hope to know more next week. It's felt good to get everything out and challenge myself to create with what I already have at my fingertips. Ever since my snow globe discovery (here), I've been in what people in the "biz" call "flow"....hahahaha....that sounds so funny. But, there is some truth to creatives being "in the flow". Some days it takes all I can do to spit out a simple card. Other days, I can produce new things, that leads to more new things, that leads to exciting new things. It's been a week of both. Talk about creative whiplash! I wanted to share some of the things I'm doing. I hope you are inspired to pull out your stash and PLAY a little. I wish you a weekend of being in the "flow" ofyour current project. By the way, Stampin' Up! has a 2" hole punch that works marvelously for punching this paper out....I realized this shortly after tracing the cork circles! I bleached green bottle brush trees....this should come with warning: It's addictive!!!! Such a versatile stamp set! It includes Halloween, Christmas, Hang in there, and Valentine's Day! Love, love, love how it's designed. Check it out! The Wonderbasement was born many years ago. My boys were about 3 & 6 years old when I fell in love with scrap-booking and rubber stamping. 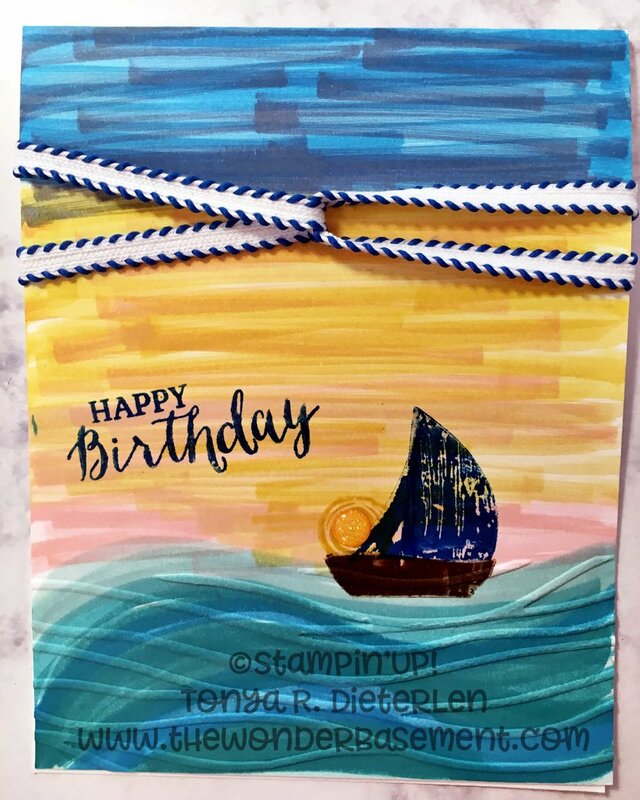 I began making cards and teaching classes in all things papercraft and stamping. My obsession wasn’t limited to just paper, I loved home décor and anything thing I could get my creative hands on to stamp, color, paint, stencil, glue, etc. 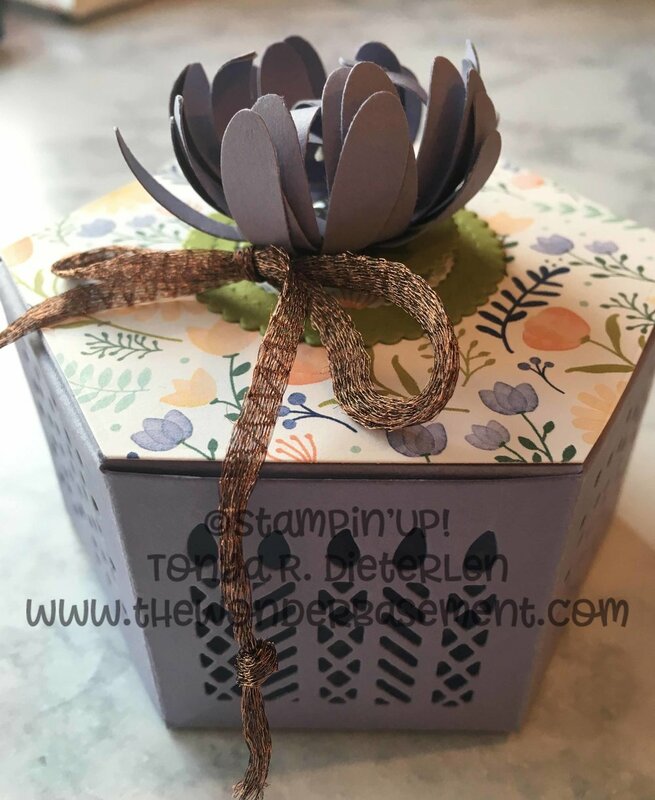 I became a Stampin’ Up! Demonstrator and set up a small studio in our living room. When we bought our house, in ahem, 1989, it was a basic 3 bedroom, 2 bath ranch with a full, unfinished basement. Built in 1978, the basement had been studded and plumbed for a bathroom and kitchen and a couple of more bedrooms, in addition to the full family room area. It was also a walk-out. We knew that someday we’d have children and possibly have one of our parents living with us. My dad, was had Multiple Sclerosis and we wanted to purchase a home that had options. For the first 10 years or so, we used the basement as a storage place for various tools, furniture, etc. I also used it as a staging & workshop area for a floral & Christmas decorating business. Around the 10 year mark or so, I had started at least 2 businesses (more like 4), and the kids were rambunctious little boys. I worked from home with the boys by my side. 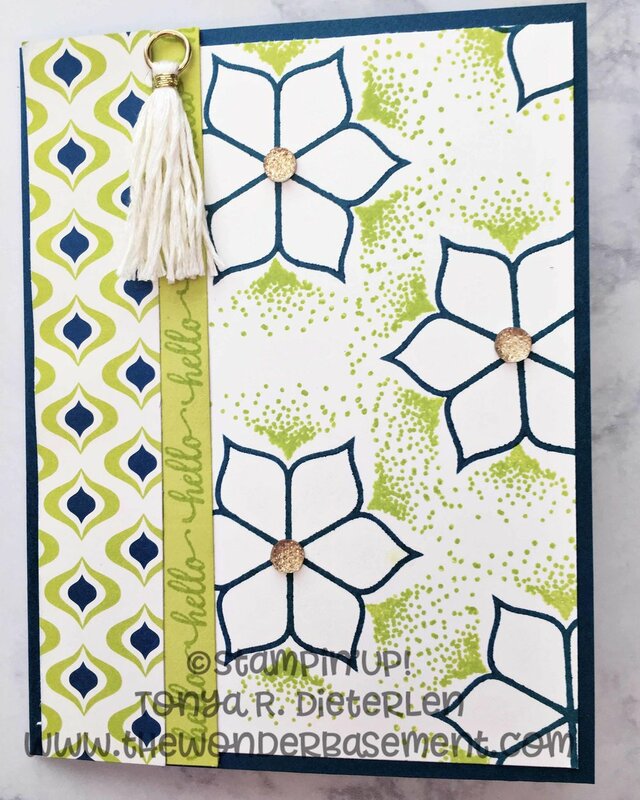 As I grew my stamping business, I would have classes during the day and in the evening. I needed more space for the kids to be able to play and the moms be able craft…both in a safe, fun and happy environment. Half of the basement was dedicated to the kids toy room and movie area. The other half was the mom’s craft and coffee drinking space! Most of my customers were other moms like me. We all needed some fun adult conversation, encouragement, and a place for the kids to romp and play and burn some energy for the afternoon nap! It was playgroup on steroids for mom and kids alike! When the boys entered school, it became the place of PTO committee meetings, church meetings, bible studies. Served as the meeting place for several boards and organizations with which I’ve been involved. After several years of hosting friends, playgroups, bible studies, life-groups, Easter egg decorating parties, cookie baking days, super-bowl parties, birthday parties, graduation parties, and having many people over, someone called it the WONDER-basement! And it stuck. The wonder-basement. The WONDER-Basement. THE WONDER-BASEMENT. Yes. It. Is. Now it serves a space for my Art Studio, my 23 year old son’s office, my husband’s office. Our family has a variety of interests: Mine is art, mixed media, jewelry making, and art. Joey (23) is a video game designer, and my husband has his electronic hub, office and eBay store. Patrick (20) is a college Sophomore studying Film Production, so I wouldn’t be surprised if it becomes a temporary film studio at some point! I always wanted our home to be the center where life happened. I wanted all the neighborhood kids to hang out at our house. I wanted to feed them and love them and give them an environment that was fun, safe and peaceful. I did that for my family, and what happened was, it became everyone’s favorite space! It truly is WONDER-ful, because it has touched so many lives. We’ve had the freedom to enjoy it and I thought it was time to take idea of the Wonder-Basement, and our philosophy online to share with the world! So welcome to the WONDER-basement. Where glitter flies and people come together to do life.